Wx: Sunny with good visibility. High’s in the 60’s. Excellent early spring weather for hiking. 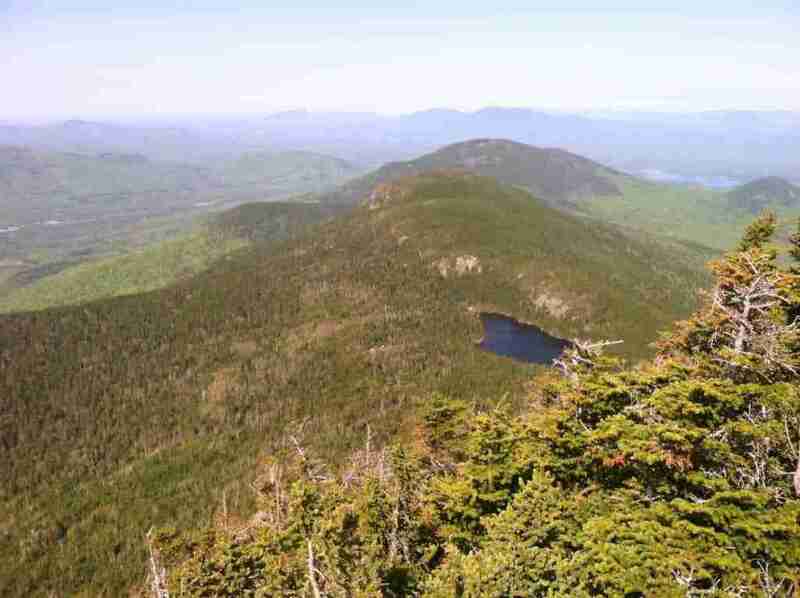 Goal/Purpose: To hike to the summit of West Peak, camp overnight at Horns Pond and attempt my first amateur radio Summit on the Air contact (SOTA). 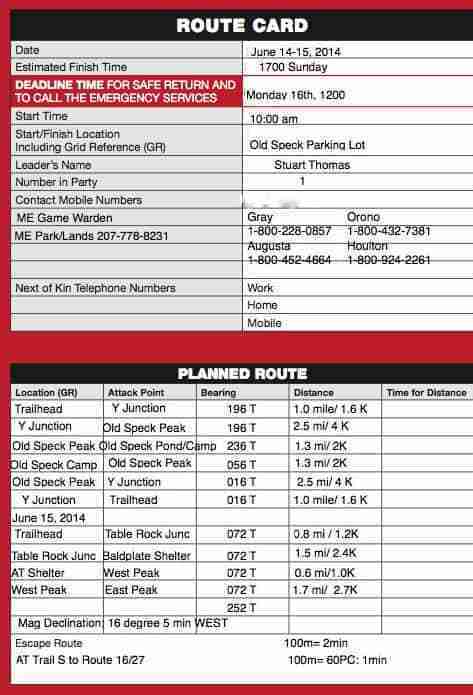 Route: Start at the trailhead on Route 16, hike up to Fire Wardens trail to the Horns Pond Campsite for the night. 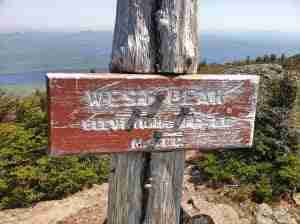 Next morning, hike to West Peak and attempt radio contact for SOTA. Descend to the trailhead. 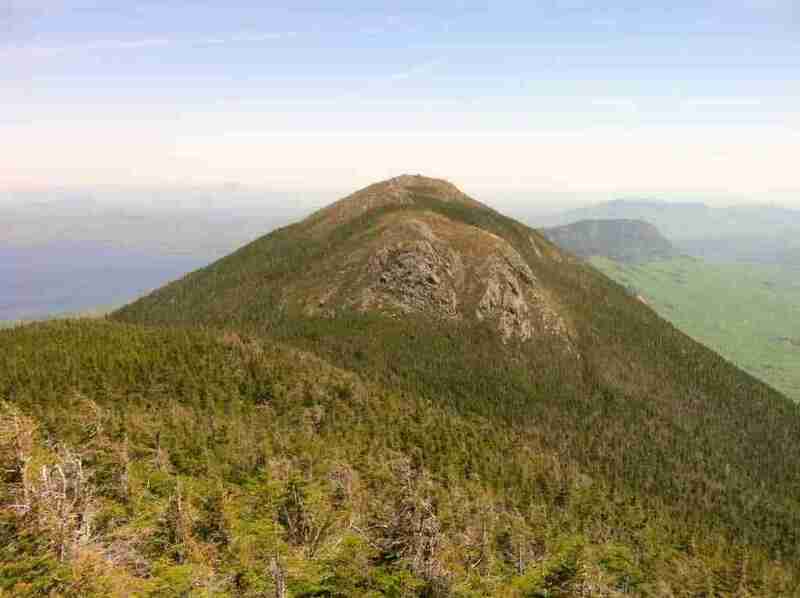 The Bigelow mountain range is one of my favorite hikes in Maine. I first hiked it two years ago and walked the entire trail out and back to the trailhead in one day. Going up and down destroyed my knees and I ended up limping back to the trailhead in excruciating pain. Two years later I spent considerable time strengthing my knees, and made the hike with zero pain. This route is a challenging climb up to 4,000 feet. However, the views make it all worthwhile. Gear: Temperatures were relatively warm, even at 4,000 feet so I packed light for the trip. I did bring a lightweight jacket and used it in the morning until I warmed up. No major gear malfunctions to report. I recently switched over to a MSR Pocket Rocket which uses iosbutane canisters. Previously I had been using a DIY alcohol stove (cat food can stove). While it worked well, was dead simple, and lightweight, I consistently managed to get my hands covered with the fuel. So for simplicity, I switch over to the MSR stove. 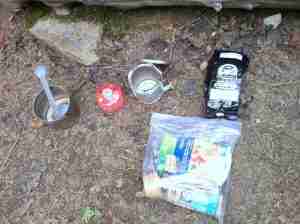 Using that stove along with a Ti pot and pouch meals, makes eating/cleaning quick and easy which is highly appreciated while tired. Note: I am using an empty coffee bag for trash. Keeps the smell down after a few days in the heat. Speaking of tired, once I arrived at the Horns Pond campsite, I found the site to be deserted. 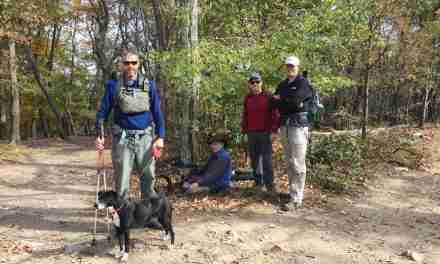 The Horns Pond campsite is a huge camp site located right on the Appalachian Trail (AT). You will find a lean to shelter, a beautiful pond, and a caretaker (who wasn’t there when I arrived). Getting settled in, I procured clean drinking water for the rest of the trip. My SteriPEN Ultra made short work of getting drinkable water which was important as I had drank all my water in the past two hours. I chose to set up my tent towards the edge of the site and noticed the bear buckets for storing food. That night was quiet and peaceful. The stars at that elevation were incredible. In the morning, I made myself a cup of coffee, ate some breakfast and started out for West Peak. Radio Operations: Let’s just get this right out of the way: I got really lucky that day. At 4,145 ft (263m), it was sunny, warm (60’s) and light wind, which is unusual for that area. 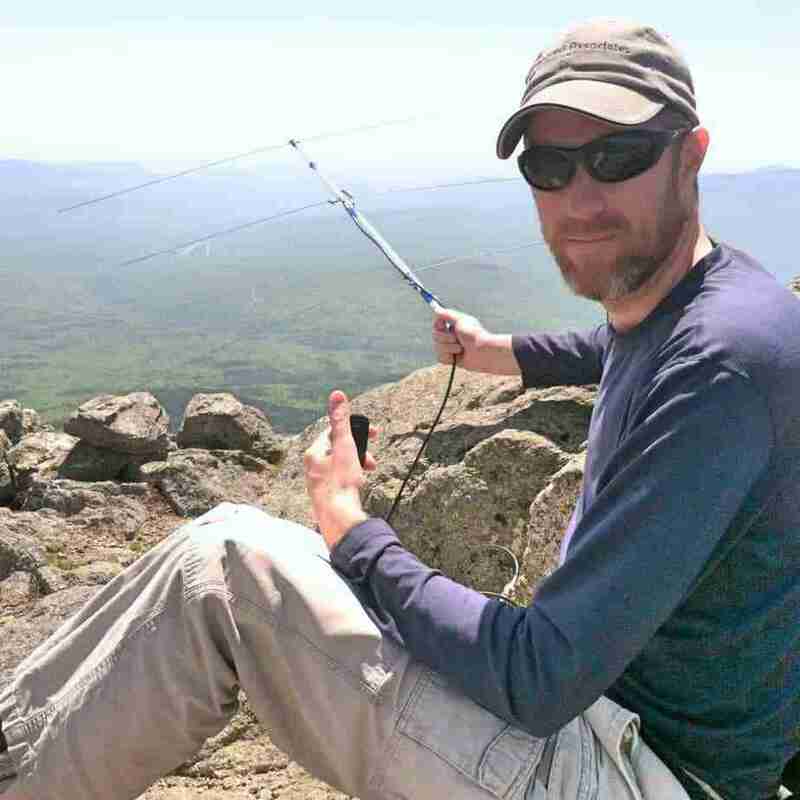 I also activated my first summit (W1/AM-003) for SOTA! Once I got to the summit, I set up my DIY UL Yagi antenna, which consisted of piano wire, some clear acrylic tubing I had kicking around, and coax with alligator clips for quick assembly. The antenna wasn’t the most sturdy setup and piano wire elements were getting pretty battered by the wind. Nevertheless, I tuned to 146.520 Mhz and started throwing out CQ (Calling all stations) that I was on the air for SOTA and looking to make contacts. Being that a Yagi is a directional antenna with high gain I rotated the antenna by moving myself around from roughly 100 to 260 degrees, considering the majority of the population in Maine is south. I also swung to the NNW, to see if I could talk to someone in Canada, as the Canadian border was only 30 miles away. For a radio I was using a Baofeng UV-5R handheld FM VHF (4 watts). While not a fan of Chinese radios, considering the cost, I figured I would buy one and see how well it would hold up to my rough use in the backcountry. During the course of an hour, I made 5 contacts. These contacts allowed me to activate West Peak, making me the second SOTA member to activate it. The first two contacts I made, I was unknowingly on low power (1 Watt!) Once I realized I was on low power, I switch over to high power (4 Watts). W1NOV QTH: Plymouth, Maine *55 miles distance! 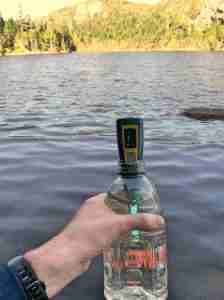 N1UB QTH: Sydney, Maine *60 miles distance! 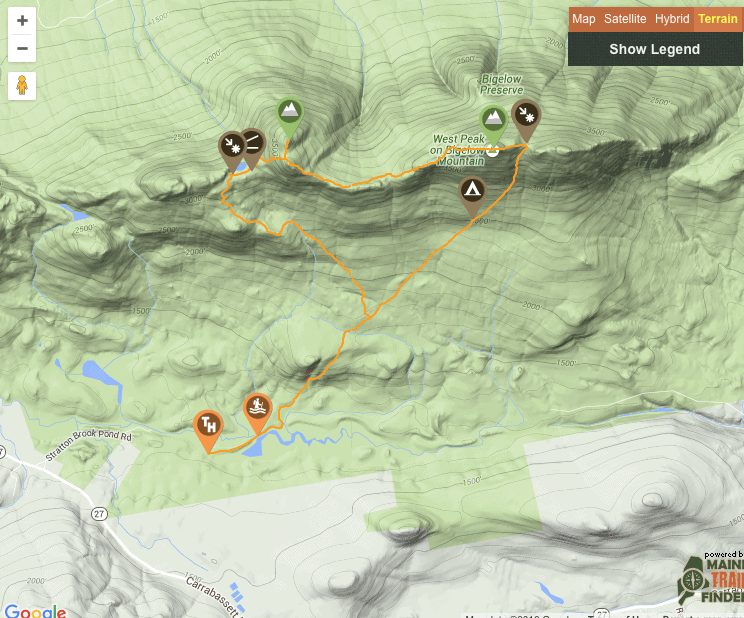 Navigation: The counterclockwise trail route that I took makes for easy navigation. I did bring my sun altitude tables to verify directions using the sun and local time. If your interested in learning this technique, I can’t highly recommend enough the book “Ultimate Navigation Manual” by Lyle Brotherton. Misc Notes: As I finished my radio operation, two older gentleman appeared at the summit. They seemed perplexed at what I was doing, which is understandable. They climbed the summit only to see some strange guy waving a wand around with porcupine like spikes, talking into a radio with some strange gibberish. Often, when people see me operating they ask what in the hell are you doing? I usually reply that I am doing a radio contest and that seems to appease them (and not call the local law enforcement). Everyone understands contests, even if they don’t get the radio part. Maybe if I had a clipboard, an orange vest and some kind of ID badge people would assume I was on “official business”. The only business I had that day was turning DC power into RF. Overall: A+ trip. 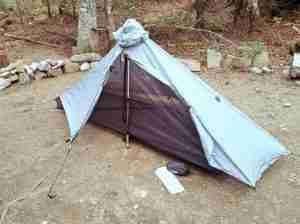 Great weather conditions, luxury camping/sleeping conditions, and my first SOTA contact.